Reviews of releases from Terry, GL, Rachel Maria Cox, Two Steps on the Water, Baro and Remi, Suss Cunts, Sarah Mary Chadwick, BATZ, and Gretta Ray. TEETH & TONGUE’S JESS CORNELIUS: Teeth & Tongue are about to be four albums deep. Give Up On Your Health is their most gregarious yet. This is a Jess Cornelius with a new lease on rhythm, a new sense of feeling yourself in the music led by the increasingly wild recent live shows where her and her band have, despite a catalogue slick with moody burners, upped the party every time. Over in New Zealand to tour latest single ‘Dianne’, Jess takes stock of the last two years between albums. ALEX LAHEY’S LITTLE SECRETS: From Animaux to going solo, Melbourne’s Alex Lahey has been peddling pop to the indie kids for over half a decade now. Only recently, it’s begun to take off. Her second solo single, ‘You Don’t Think You Like People Like Me’, feels like it has all the makings to hit the Hottest 100, but by then that might be the least of her accolades. Her rubbery rock arrangements and penetrating lyricism has just been glued together in her debut EP, B-Grade University. She’s played Splendour. She’s getting ready to go international. The last year has been a whirlwind, but Lahey insists there’s no secret. EILISH GILLIGAN IS IN CONTROL: The two singles Gilligan has released so far — ‘The Dogs’ and ‘All The Time’ — are brilliant showcases for the singer’s vocal talent and style, but they’re slight compared to what’s coming. She presents the listener with a portrait of wild emotion that’s sometimes uncomfortable but always compelling. I caught up with Eilish at Greensborough Plaza — the land that time forgot — to chat about nostalgia, her influences, and The Universe. REBEL YELL: OUT FOR PERFECTION: So you wanna make heavy industrial dance music in Brisbane — one- or two-person synth stuff that goes hard as hell. Well you have to really want it, ’cause you’re gonna be pIaying at 8:30 on five-band lineups before your friends’ guitar bands, and you know it’s not gonna be loud enough or dark enough for the crowd to do anything except nod their heads and maybe tap one toe off-beat. Grace Stevenson (Rebel Yell) really wants it — and she’s got the necessary vision, and (close your eyes rock dogs) the ambition and organisational skills to make something happen. 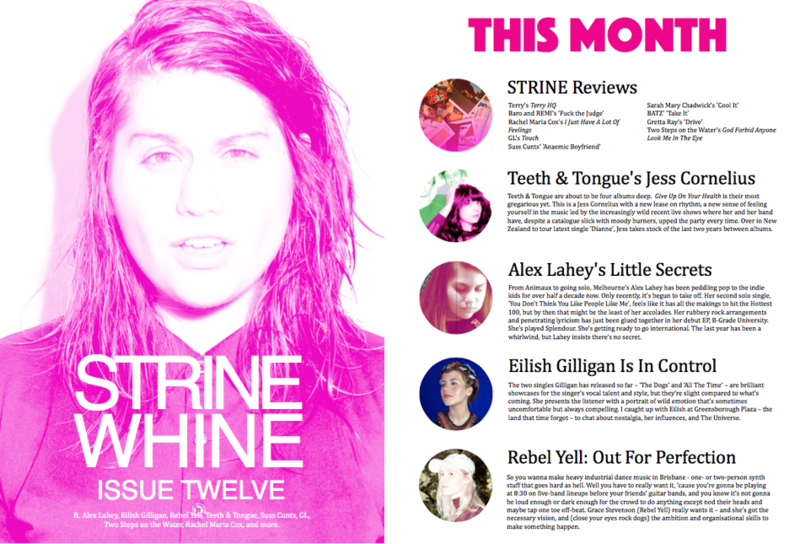 This month’s cover yarn spindles its way through Alex Lahey’s nascent career. A year deep on a solo run, Lahey’s already doing pretty well. Here’s an excerpt on her recent run-ins with triple j. The first airplay ‘You Don’t Think You Like People Like Me’ picked up was from Bridget Hustwaite over at triple j Unearthed. Hustwaite met Lahey at least year’s BIGSOUND just after ‘Air Mail’ had come out. In the months after, Hustwaite was drafted into the Unearthed team, scouring uploads from the nation’s hopefuls to add to the digital channel’s playlist. That’s how she came across Lahey’s second single. Treweek and Dawson were proven right.